The Business System Limited (B.S.L.) and Bluesky School Netball Champ of Champs 2018 kicked off the first day of the tournament yesterday morning. Held at the National University of Samoa Gymnasium, 20 Secondary Schools from all over Samoa were first assembled for the opening ceremony before taking the battling out in Court. Principal of Leiifiifi College, Sifuiva Malea Lauano, greeted and welcomed all the players, team managements and supporters. This was followed by a short biblical encouragement led by Papauta Girls High School Principal, Misimasefili Tu’uau. 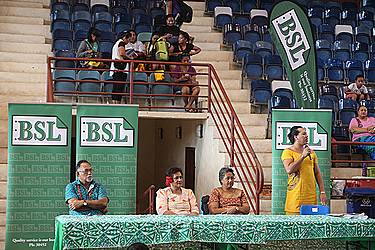 The key note address was delivered by the President of Samoa Secondary Schools Principal Association and Avele College Principal, Matafeo Reupena Matafeo. Matafeo encouraged the development of this sport through the local talents in Samoa. He also reminded all the players that the successful Samoa National Weightlifting team that competed in the recent Commonwealth Games in Gold Coast, Australia, comprised local players. B.S.L. Marketing Manager, Leeroy Feaunati said they are very excited to be part of this event together with Bluesky and Samoa Netball. Feaunati believes this is one of the initiatives by B.S.L to give back to their customers, especially the Schools. “We are very excited to be part of this event working together to support netball competition among the secondary schools here in Samoa. “As Matafeo stated earlier, this sort of competition that can expose the standard of local talents that we have and B.S.L supported that 100 percent. Six College’s from Savai’i competed in this year, including Alofi o Taoa College, Don Bosco School, Itu o Tane College, Church College of Vaiola, Mataevave College and Amoa College. Anoama’a College, Maluafou College, St Mary’s College, Samoa College, Paul VI College, Palalaua College, Aana No.1 College, Aana No.2 College, Pesega College, Lefaga College, Chanel College, Papauta Girls High School, Faatuatua Christian School and Leulumoega Fou College of Upolu are also competing. The tournament is scheduled to host their finals today.